Whether you're a competitive tournament player or a recreational player, Winning Racquetball: Skills, Drills, and Strategies will help you improve your game. The authors veteran instructor Ed Turner and #9-ranked professional racquetball player Woody Clouse show you all the shots and strategies for success on the court. And you'll see them from two views: the objective eye of an instructor and the keen competitive eye of a touring professional. mental conditioning and outthinking opponents. This invaluable handbook is divided into three parts that cover everything you need to know. In Part I you'll learn how to pick out the equipment and facility that's right for you. The authors also outline a conditioning program that will help prevent injuries and improve your skill level. Part II shows you how to use practice sessions and drills to broaden your arsenal of shots. You'll strengthen your forehand and backhand and learn how to hit effective passing, kill, backwall, and ceiling shots. The authors also address the all-important serve. If you're a competitive racquetball player, the secrets you'll find in Part III of Winning Racquetball are indispensable. You'll discover how to use your brain as well as your feet to cover the court, outthink your opponent, and play effective doubles and cutthroat games. And, top-ranked player Woody Clouse gives you a glimpse of the practice regimen and professional demands of an International Racquetball Tour professional. You'll also find a practical miniclinic designed to help you diagnose and correct the 13 most common errors made by racquetball players. How-to guide for players at all levels. Ed Turner, PhD, is a professor in the Health, Leisure, and Exercise Department at Appalachian State University in North Carolina. He has taught racquetball at the university level since 1978 and racquet sports since 1964. His students have included top open racquetball players, such as Wiley Fisher, Jin Yang, and Eric Gentry. In 1990 Turner received the North Carolina College Outstanding Physical Educator of the Year award. He has written numerous articles on racquetball strategy, and he's the coauthor of Skills & Strategies for Winning Racquetball and Innovative Theory and Practice of Badminton. In addition to being an accomplished instructor, Turner is a top-rated open tournament racquetball player. He lives in Boone, NC. Top-ranked International Racquetball Tour (IRT) pro Woody Clouse knows from firsthand experience what it takes to excel in the sport. As the lead instructor for the IRT, Woody is the best when it comes to helping other players excel too. He also serves as the media relations director for IRT. A professional instructor since 1979, Clouse serves as consultant to the top professionals in the world. In 1987 he coached the Ecuadorian National Team. Clouse conducts racquetball clinics and seminars, and is the featured instructor for ESPN's Racquetball Show. As a monthly contributor to KILLSHOT Magazine, Clouse shares his insights into the game and the strategies he learned from all-time racquetball greats like Bud Muelhieson and Cliff Swain. He lives with his wife, Jacqueline, in Truckee, CA and enjoys hiking, surfing, and skiing. 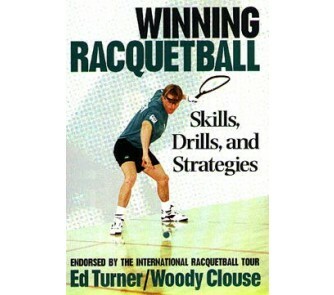 "Winning Racquetball excels as a training tool because it combines Ed Turner's clear, to-the-point teaching approach with the rich personality that has made Woody Clouse one of the most colorful touring pros in the history of the game." "Clouse brings the same intensity, excitement, and knowledge to Winning Racquetball as he does to the court. A great book for novice to pro." "This book is excellent for beginners and advanced players. It is extremely easy to read and understand."